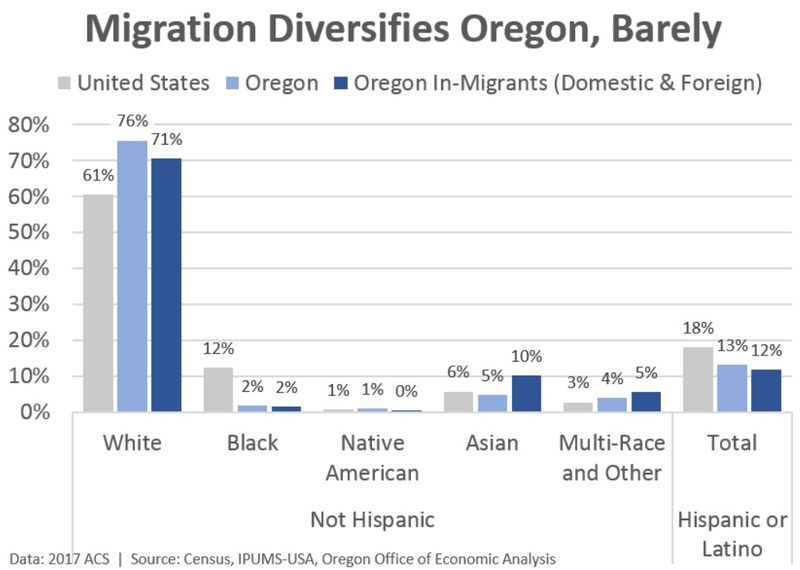 A couple years ago we examined Oregon’s diversity and the fact that Oregon’s foreign-born population is fairly similar to, albeit smaller than the U.S. as a whole. Now, Oregon does have a somewhat larger Mexican-born population, but many such residents moved to the U.S. during 1980s, 1990s and through the housing bubble. Few have migrated in the past decade or so for a couple of main reasons. First, due to the housing collapse and Great Recession, there were scarce job opportunities here and Mexico’s economy has done well. Second, the falling birth rate in Mexico over the past couple of generations means there are relatively fewer potential migrants than in the past. Now, a lot of pixels have been written in recent years about the big shift the U.S. has seen among international migrants. No longer do most come from Mexico or Central America. Now most come from Asia. Here in Oregon we see similar trends. Overall, those moving to Oregon are somewhat more diverse from a race and ethnicity perspective then the current population. However these shifts are on the margin when compared with national figures. The vast majority of new Oregon residents are non-Hispanic whites that largely moved here from other states. In fact, new residents are surprisingly, at least to me, less likely to be Hispanic or Latino then current residents in the state. Breaking this down a bit further, Hispanic or Latino foreign migrants to Oregon account for just under 3% of all Oregon migrants in the most recent Census data. The other 9 percentage points of Hispanic or Latino migrants arrived from other U.S. states. These figures are lower then nationwide estimates. Where new residents differ the most is the higher share of Asian migrants — twice as large as the current population in percentage terms. The breakdown here is about 34% Chinese, 11% Japanese, and 55% all other Asian countries or pacific islands (this is self-identified race and combines both domestic and foreign migrants to Oregon). This differs quite a bit from the current Asian population in Oregon which is 21%, 6%, 72%, respectively. One key aspect to Asian migration is the impact on our colleges and universities. This increase has been beneficial for our higher education system and regional economies, however as such enrollments dropped the last couple years, it has been somewhat of a drag on growth. Now, the big question is what does this mean and what are the implications for the economy? Well, it is hard to answer definitively whether Oregon’s general lack of diversity is holding back the regional economy. Growth this cycle in Oregon has outpaced the vast majority of other states, like always. However in a world where international trade in services is increasingly important, having a local workforce who can speak the language and know the customs of other cultures is important, in everything from business relationships to contract language and the like. 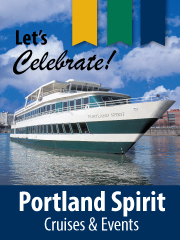 Oregon has proven the ability over the decades to attract and retain talent as needed. However it is possible the lack of an existing workforce along these lines may preclude firms from opening and expanding here. This is potentially the opportunity cost for the regional economy. Similarly from an individual’s perspective, she may be less likely to live in a place where few people look like her, worship like her, and the like. Bottom Line: Oregon is becoming more diverse over time. This is in part due to births, but also in part due to migration trends. However these shifts are small in any given year. Demographics change only slowly over time, but are powerful forces.